The recovery has begun. So say many Distributors. In our Second Annual Business Forecast, Welding & Gases Today randomly polled, by telephone, GAWDA Distributors located across the country. We found them optimistic, for reasons ranging from increased demand to technological advancements to new sales methods. Many believe that the days of giving product away are coming to an end, and that the increased emphasis on price-cutting is coming to a close. On the other hand, no one believes that the downward pressure on pricing will change in the near future. Distributors are likely to continue to face increased costs to doing business. Double digit increases in insurance premiums — health, property and casualty — and budgeting for increased overhead associated in maintaining long-tenured employees will force the winner in 2004’s race for improved margins to keep his or her eye on the bottom line. It is unlike GAWDA members to let a few challenges deter them. Over 89% of those interviewed predict a sales increase, some by as much as 22%. The overall average increase is about 8%. Let the Distributors themselves tell you how they plan to accomplish such high goals. All of the distributors interviewed from the Southern region of the United States expect their business activity to be up, anywhere from 2% to 20%. Most were guarded in their optimism, holding the average increase to 8.3%. Zane Lee, president, Sidney Lee Welding Supply (Hampton, GA), is one who is careful with his enthusiasm. Lee notices that his customers’ business is starting to come out of the doldrums. As their business returns, he expects to realize a 3-5% increase after three straight flat years. Difficulty in maintaining margins won’t make it easy, though, notes Lee. Beyond that, he is focused on improving customer productivity, and has upgraded some products, such as different wire so they can weld faster. “We’re not trying to sell something for a nickel less; we’re trying to find something that will benefit the customer and we can still make a profit. That way we both can win.” Despite his positive outlook, Lee knows there are still challenges ahead, particularly the disappearance of manufacturing jobs across America. “We’ve lost customers that either went out of business completely or consolidated their operations away from us,” he notes. Another challenge is balancing the interests of both large and small customers. “Larger customers want us to bring them new ideas on a regular basis, so they know we’re looking after their interests. Smaller businesses are satisfied as long as we treat them right and are responsive when they need help. We don’t have to show them a miracle every month,” he explains. Lee and his team enjoy finding new solutions that make his company a valuable partner to customers. On the other hand, Southern Welding Supply (Birmingham, AL) is aiming to diversify its product offerings. “We’re looking to diversify because we don’t feel that when welding comes back it’s ever going to be as strong as it was. Too many jobs are gone and plants are closed,” says Vice President Randy Puryear. He foresees that diversification will yield a 6-7% sales increase this year, and he would like to hire more employees: a purchasing agent, more sales staff and several drivers. Puryear also notes that, like every year, one challenge is to “keep up with the way business is changing,” citing examples like integrated suppliers and the Internet. Southern Welding Supply (Savannah, GA) projects a 6-8% sales increase in 2004, and Kirk Duffy, president, says this activity will be the result of “expanding our workforce and our capabilities at the same time as some of our competitors are restructuring and cutting back. We refigured the way the company operates to get more people in front of customers.” While equipment consumables were down at the end of last year, gas volumes were holding up well, and Duffy will concentrate on expanding these markets. His biggest obstacle in 2004 will be competition and pressure to reduce costs. Distributors in the East expect sales to increase anywhere from 2% to 13.5%. There are few plans to add new people or products, and they cautiously keep their toes in the water, waiting for the tide to turn. Joseph (Bo) Martin III, president and CEO, Middlesex Gases & Technologies (Everett, MA), also believes that maintaining profitability in the face of double digit increases in the costs of health, property and casualty insurance will continue to be a challenge for all distributors. In light of positive numbers experienced during 4th Quarter 2003, Martin is more upbeat than he has been in the past. “As a small independent, we’ve been able to absorb the hits of the past and we are able to move quickly, jumping through hoops when necessary to support our customers as the economy recovers.” Martin expects the biotech and pharmaceutical industries to continue to do well, and his welding and equipment business will be the beneficiary of a welcome resurgence in activity. “I expect sales of gases to increase by as much as 5%, while equipment sales may increase only by 3%.” He adds, “We will continue to invest resources in our gas business serving the biotech and pharmaceutical business.” Martin looks forward to adding an additional store to better serve his customer base. A slow and steady upward climb in her industrial customers’ activity causes Laurie Waller, vice president, Vince’s Gas & Welding Supply Co. (Carnegie, PA), to predict a 4-5% overall growth in 2004 sales revenue. “Half of our gas business is medical, which, regardless of how the economy fares, grows by an average of 10-15% each year,” she says. “I expect our industrial business to grow by 2-3% in 2004.” Waller points to her company’s ability to stay close to the customer in the face of increased competition and a never-ending pressure to drive pricing downward. Peter Giorgi, president, Tec-Con (Darby, PA), is projecting a growth in sales of 7%, predicated on a 2nd Quarter rebound. To Giorgi’s chagrin, more customers are relying on several suppliers as they make their price-driven decisions. “Right now, it seems that the level of expertise a distributor can offer does not carry the weight it used to.” To counteract this new wave of purchasing, Tec-Con is structuring services to be able to provide more services to more customers. Says Giorgi, “If a customer cannot afford a new piece of equipment, our goal is to competitively repair it, acting as a partner rather than as a supplier.” He anticipates adding another location in 2004. Vince’s Gas & Welding Supply Co.
Three-year-old company Twin State Welding Supply (Lebanon, NH) will grow its sales by double digits in 2004, as it did in 2003, says John Brockway, president. “As a small company, we will explore other niche businesses in order to meet more of our customers’ needs. We are asking customers about products they would like to purchase locally, products they would like to be stocked locally, rather than buying from a catalog.” One of the company’s initiatives this year is to find and purchase a site to locate company headquarters and add a filling station. A combination of sales to health care facilities and nursing homes and new R&D centers moving into the area will drive a 10% growth at Seaboard Welding Supply (Oakhurst, NJ), indicates President Richard Nowell. He says, though, “I’m anticipating a hefty price increase for a number of gases beginning with helium and possibly CO 2 because of a shortage.” Nowell also indicates that his company’s reputation for attentive service and the performance of his employees has helped him to capture increased market share. 2004 sales numbers are likely to be even with 2003 numbers, says Michael Smigen, president, United Welding Supply Co. (Amsterdam, NY). The customer is fairly diverse. Says Smigen, “We have a lot of smaller customers who have offset the difficulties we would have had if we were totally dependent on major manufacturers.” Smigen saw the purchase of capital equipment picking up as the new year began. Small Distributorships across the United States expect sales activity to increase an average of 8% this year. Medium-Sized Distributorships expect it to increase at a similar rate of 8.1% , while Large Distributorships expect an increase of only 6% . 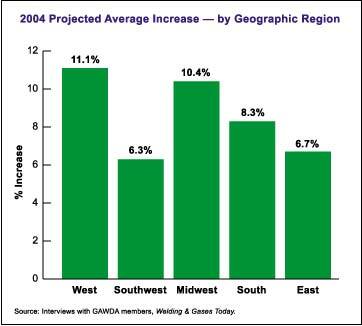 The Southwest region will pick up a bit, but will be a little slower than the rest of the country, as distributors here predicted an overall increase of 4%. Eric Meyers, general manager at Vern Lewis Welding Supply (Phoenix, AZ), foresees a similar sales increase of 10%. “We’re taking a close look at what we’re doing to see if there are ways to improve,” he says, and he is concentrating on increasing employee expertise. “We take a no excuses approach to our customers, and we pride ourselves on our level of technical expertise.” Meyers believes that providing solutions for customers will make his company a strong value-added partner. Welding Supply House (Lafayette, LA) business is almost wholly dependent on the price of oil and worldwide events in the oil-producing countries. CEO Bill Delcambre II says this makes it difficult to predict sales a year ahead for his company, whose major market is oilfield service companies. Judging by what he is seeing now, though, Delcambre expects a 6-8% increase in 2004. Other than trying to forecast petroleum costs, Delcambre says the biggest challenges facing his company are government regulations and liability insurance costs. Extended payment schedules are also complications for General Welding Supply (Lovington, NM). “Collecting all the money people owe us will be a challenge,” says David Green, vice president. He acknowledges that some of the newer technologies and industry trends reach his region more slowly, and he will work hard to stay on the front end of things in order to provide the best solutions for his customers. A host of new opportunities in the area are available to spur business, including a new horse racing track being built in the county, along with hotels and a uranium enrichment plant. All this leads Green to predict business to be up, although he doesn’t venture a guess at a percentage. 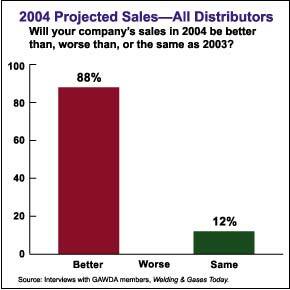 Only 12% of distributors expect sales activity to be the same this year as it was in 2003. 88% expect it to increase. There is a lot of activity in the West as more distributors than anywhere else in the country add new lines, additional drivers, sales staff and mixing plants to their mix. For smaller distributors like Don Fox, operations manager at Willett Bros. (Lewiston, ID), the continual pressure to meet new regulations pertaining to medical gases is an ongoing challenge. Fox explains, “We are not large enough to employ a full-time specialist, and the costs associated with compliance tend to add a dollar here and a dollar there, eating away at our profit margins.” Still, Fox looks forward to a 10% increase in sales in 2004. In order to support the pressured profit margins, Fox will continue to manage his inventory with an eye towards better turnover on products that remain in stock. Welders Supply & Equipment Co. (Chula Vista, CA) is positioned well. “We can run lean and mean anytime we want to,” says Vice President of Sales Gary Caddell. “We don’t have a big machine to feed, and we’ve been fortunate to have several key customers who have remained active.” Caddell points out that the trickle-down effect of naval ships returning to port after being in the Gulf is very positive. An emphasis on paying attention to his customer base will lead to a 10% increase in sales in 2004. To further support sales, the company will delve deeper into specialty gases and will perform its own mixing. The timber industry will drive a sales increase of at least 15% at Coastal Containment and Welding Supplies (Aberdeen, WA). Jerry Thompson, president, says his location’s lack of a manufacturing base has forced the company to diversify products and services and to pay more attention to the details of what customers require. “If the customer calls asking for CO 2 for a wire feed, we need to know that the individual customer is actually using argon/ CO 2 .” The largest percentage of sales for Thompson’s company is oxygen, and his goal in 2004 is to begin filling his own cylinders. The business climate in the territory covered by WESCO Redwood (Redwood City, CA) varies, as do projections for 2004 sales activity. Michael Beckley, president, says, “In the San Francisco Bay area, a new power plant is being built in addition to several high-rises, which will support an increase in sales of 8-10%. We are smaller in the Sacramento area and should realize an increase of close to 20%. A focus on medical gases in the Reno area will drive an increase in sales of 30-40%.” Despite the variations, two things are constant. “We continue to oil our chain, and we continue to provide service,” says Beckley. In 2004, WESCO Redwood will pursue more beverage CO 2 business, while the biggest challenge remains the recruitment of qualified personnel. The company is looking to develop a three-year, in-house apprentice program. Beckley also plans to add a safety training program and a security manager who will be responsible for training company personnel and customers. California Tool & Welding Supply (Riverside, CA) is focusing more on the bulk gas business as the smokestack industry in California continues to erode. Robert Craig, partner, expects sales to increase by 5-10% in 2004. He says, “We will see the most growth as we sell more CO 2 to the beverage industry and nitrogen to the food industry.” Until April 2003, the company outsourced the delivery of CO 2 to ten food and beverage customers. A new subsidiary company employing four trucks is now servicing 450 customers. Also contributing to growth in 2004 are universities, energy customers and several cement plants. Hearing less “doom and gloom” comments from his customers, Ron Adkins, president of Valley Welders Supply (Billings, MT), indicates that his 2004 sales will increase by 3%. Valley Welders Supply’s diverse customer base is made up of oil refineries, coal mines, power plants, farmers, ranchers, fabrication shops and medical facilities. Recruiting qualified personnel remains a challenge. “We are now seeing a younger applicant who does not want to work his way up from the bottom,” Adkins notes. He has hired a few of them but finds the retention rates dismal. To increase efficiencies, the company is instituting several operational improvements. For instance, by better managing the delivery of CO 2 products, overtime costs for drivers were reduced; and by developing a more efficient order-picking system, the number of warehouse personnel was reduced by one. “The industry has learned that we cannot make money by continually slashing prices,” says Eric Younger, president, The Younger Group, dba Colorado Welding Supply (Colorado Springs, CO). Younger will continue a push towards getting back to basics in an effort to grow his sales by 20-25% in 2004. The three-year-old company is targeting specialty and medical gases in order to realize this projected growth. Lynn Cook, president of Humphries Incorporated (American Fork, UT), anticipates an increase in sales of 10% as a result of capturing increased market share. The company is picking up business from customers who are not happy with the competition. Says Cook, “Sometimes, absorbing the cost of a hazardous materials charge or a document fee can make a difference for a potential customer.” Cook has noticed that customers are taking longer to pay their bills, and in some cases, Cook insists on COD. The company is exploring the possibility of adding a new store in 2004. Distributors who expect their sales to increase in 2004 project an increase ranging from 2.5% to 58%, with the average increase at 8.9%. Perry Johnson Jr., president of Hohenschild Welders Supply Co. (Kansas City, MO), notes that the Midwest is still in the throes of an economic recession, and while the end of 2003 was one of the worst times in 20 years, Johnson hopes his sales will be on the upswing in 2004, at least by 4-5%. “The region is coming out of it slowly, and while things are picking up on the coasts, it will not work its way into the Midwest until at least the spring.” This is especially hard on distributors in the Midwest, notes Johnson. “Manufacturers have held off increasing prices for so long that they now are starting to increase them. This could potentially kill any recovery for us, and poses a big challenge.” Johnson will continue to work hard to keep expenses down, particularly health, property and casualty insurance. Bruce Nuttall, sales manager at Mississippi Welders Supply Company (Winona, MN), expects to experience a similar sales rise of 10-15%, citing increased order volume as an indicator. He knows, however, that higher sales won’t necessarily translate into higher profits. “Sales are up, but other expenses like insurance and fuel have gone up so much that it is quite a challenge to keep our heads above water.” Nuttall is enthusiastic about the construction of a new facility, a fill plant for gases. “We’re going to have some capabilities that we haven’t had before, which will make us more profitable on some items,” he says. The new plant will be about 20,000 square feet with some warehouse space included, and it will create a need for at least two or three new employees. Increased efficiency from a new filling facility is a reason for Superior Welding Supply Co. (Waterloo, IA) to expect better results in 2004, too. President Steve Christoph also sees production schedules going up, which should result in 3-4% growth. However, he is concerned about finding qualified people as he looks to add several positions. Christoph has no definite plans to add specific products, but will remain flexible. “As customers request, we’ll pick up different items, and we’re looking to offer more industrial items, such as construction supplies,” he says. At Lampton Welding Supply Co. (Wichita, KS), Marvin E. Lampton, president, anticipates a 3-5% sales increase, fueled by increased industrial and construction activity and an upturn in the general economy. As people spend more money, the biggest threat of 2004 will be increased competition, a challenge for which Lampton is prepared. “We are concentrating on finding customers for whom we can outperform their existing suppliers, and for whom we can do a good job, and then we work hard to convince them we are the right supplier.” In the process, the company is developing long-term contracts with these customers. As the company experiences the growth Lampton is forecasting, he will look to hire a store manager, an outside salesperson and a delivery driver to handle the workload. Fred Schoening, president, National Welding Supply Company (Bloomington, IL), expects a 5% sales gain. “Fabricators are buying equipment, and they wouldn’t be doing that if they weren’t seeing something on the horizon,” he notes. One big challenge for Schoening is keeping abreast of constantly changing government regulations and making sure employees understand the rules. A recovering economy means Schoening will likely add some workers, including a salesperson, a service person and a driver. The president of Flint Welding Supply Company (Flint, MI), Stacey Budae, hopes for a similar improvement of 3-5%. “I am encouraged that our sales will go up because I don’t think they can go down anymore,” she says. Budae assumed the presidency of the company last December, at a time when several large customers were closing their doors. Not one for selling gimmicks, Budae plans to focus on essentials and concentrate on managing the company’s growth, doing more with less. She also is looking very carefully at employee skills, and moving positions to take advantage of talent. The strengthening of agriculture, along with improvements in the high-tech and electronics sectors, lead Richard Hollowell, president of Kanox (Hutchinson, KS), to forecast a 7-10% sales escalation. Kanox recently expanded into the Oklahoma City market, and Hollowell hopes that bolstering its presence there will contribute to success in 2004. Personnel consistency is another reason to feel confident. “During the downturn, we did not disturb our sales force,” he notes. At Thompson Brothers Supplies (Coffeyville, KS), President Rick Thompson is guarded in his projection of a 2-3% increase. Part of his uncertainty is based on a change in customer mix. “Smaller agricultural customers, farm accounts, smaller manufacturing and small businesses are becoming more of a customer base for us because we’re in a rural area,” he says. The changing market makes competition fierce. “Diversification is always the key. We’ve always been tied to the industrial marketplace and we’re actively pursuing more of that as well.” Regardless of the customer, Thompson’s strategy is still the same. “Try to sell everything to each customer, from welding supplies to paint.” It allows customers to consolidate all their shopping to one source, but it also requires employees to be knowledgeable on a wide array of subjects and products, which Thompson acknowledges as a challenge. One company that has already taken advantage of the shift in technology is WeldingMart (Appleton, WI). Daniel Kossel, president, expects growth of 58% this year for his four-year-old exclusively e-commerce business. “Our success isn’t based on price, since we’re not the lowest price out there. It’s based on value and good customer service. Customers who are finding that their service needs aren’t being met are opting to use the Internet as a tool for research and purchase.” As the company grows, Kossel will add staff in customer service and online support. He estimates that the company has served 15,000 customers in all parts of the world. In order to keep up with the heavy demand, WeldingMart is constantly adding more products to its mix, and its biggest challenge in 2004 is maintaining manufacturers and suppliers who can keep up with his demand. The Experts have spoken. It’s clear that GAWDA Distributors have what it takes to survive and thrive, and we are ready to turn that corner. Glenn Fischer, president and COO of Airgas Inc., is in a good position to look at national trends for the gases and welding industry, since Airgas spans nearly 800 locations in 12 regional companies. Overall, Fischer expects Airgas business to grow by 3 to 5% this year. Driving this growth is Airgas’ objective to “outpace” the rate of market growth, according to Fischer. Airgas took advantage of the slowdown of the past two years, when the market was soft and the manufacturing segment of the business was weak, to strengthen its infrastructure and further develop capabilities in several strategic growth initiatives, including increasing sales of specialty gases, growing the medical business, strengthening its bulk business, supporting a strategic accounts initiative (which serves larger customers with multiple locations) and using safety products to achieve further account penetration.